What is culture? By one definition it’s a thriving petri dish. That’s a metaphor for human culture only if you’ve got the most cynical disposition toward your fellow man. The spirit. The fortified repast that’s better than all the rest. Melded into a cocktail, or straight up from the shot glass, this ultimate iteration of fermented barley mash is culture, or is at least cultured. And if you’re seeking culture (or seeking to deconstruct it) then you’d better deconstruct a few pints of good whiskey. Surely you’ve some idea of your choices – with soda, with water, with ice, or with none of that. There’s no final answer. Or rather the answer can only be: drink it as you like it. But there’s this bit advice: just a splash of water. You’ll hear the old-timers say this “releases the aroma.” Turns out they’re right about that; something chemically catalystic happens. 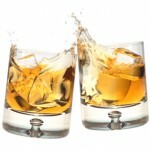 Straight, untouched whisky has a subdued aroma in the glass. Add a tablespoon or two of distilled water, give it a swirl…and a whisky blossom unfolds for you. Experience it fully not by sipping, exactly, but tasting it slowly with a wide-open mouth. As you taste, draw the fumes both into your mouth and nose. Your whisky blossom becomes a bouquet. * Whiskey is distilled in the U.S. and in Ireland. Whisky is made in Scotland, Canada, and a few other places. The method recommended above works well with whiskey, and excels with whisky. This entry was posted in New Post and tagged bourbon, cultural, cultural differences, cultural issues, cultured, deconstruct, deconstructed, deconstructing, deconstructive, deconstructs, definition of culture, I culture you, scotch, sub culture, what is culture?, whiskey, whisky. Bookmark the permalink. If you’ve perused a liquor shelf lately, you’ve probably noticed spirits labeled as moonshine. Since “moonshine” was a term used to describe illegal alcohol made at home, what you’re seeing in stores is in fact white whiskey.